As you may well know, I’m a big Hamma Bead fan. They keep my eldest daughter occupied for hours which can only be excellent. The only problem with Hamma Beads is that if you have a very prolific Hamma Beader in your family then storage becomes a problem. So thanks to some lovely ladies on Twitter I was inspired to create what’s known in the wider world as a Hamma Bead Wall. Sounds glorious doesn’t it? Well it is glorious because it stops them being chucked into a toy box and being broken into hundreds of pieces. It also gives said prolific child a chance to enjoy the work of their hands every single day. And er… Please ignore the woodchip. Thank you. Since I’ve removed, “The Many Faces of Maisie Moo”, Maisie has started to enjoy drawing and wanted to put some of her art on my blog. So as of today “Sam Draws”, will become “Kids Art Gallery” and will be a lovely reminder for me of all their drawings. 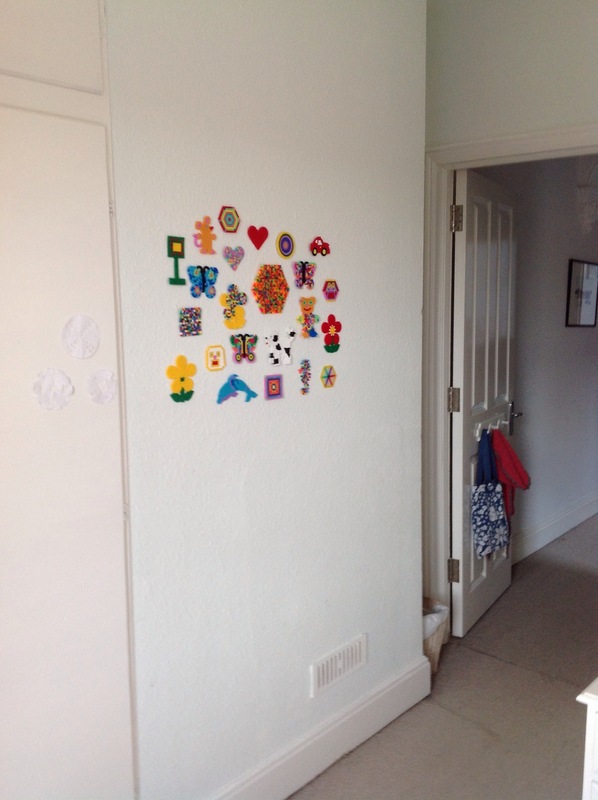 Thankfully this will also mean I don’t have to keep the thousands of art pieces (kids are very prolific aren’t they…?) hanging around the kitchen table. 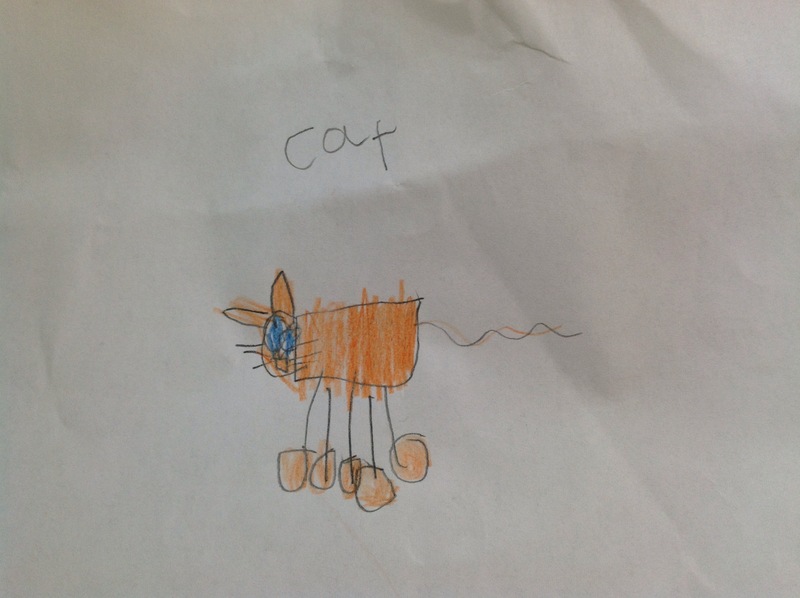 I love this little cat, I found it crumpled and folded up in her book bag and think it’s a little treasure. 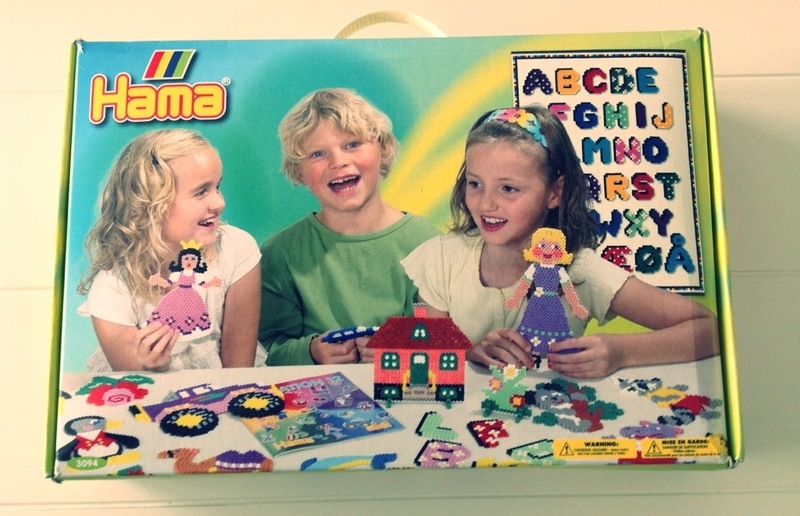 A Rather Exuberant Review of The Hama Beads Group Suitcase. I like to think of Hama Beads as a gift from God. For me and my family, they are literally like Hama from heaven (quite pleased with that). Apart from Lego and Play Dough (Dough Dough), they are the only toy we have that all the kids like playing with together. If I’m totally honest, Izzy seems to prefer throwing them around, but sometimes when she’s not feeling destructive, she almost gets it. I give it three months and she’ll be sitting with her bro and big sis, making equally impressive creations. Another wonderful thing about Hama Beads is that the whole process of making the little mosaics is fantastically therapeutic. Forget the kids, parents, if you’re feeling stressed, get the ol’ Hama Beads out, turn on the radio and make away. You’ll find yourself in a much better place after creating a day-glo dolphin or a psychedelic princess. 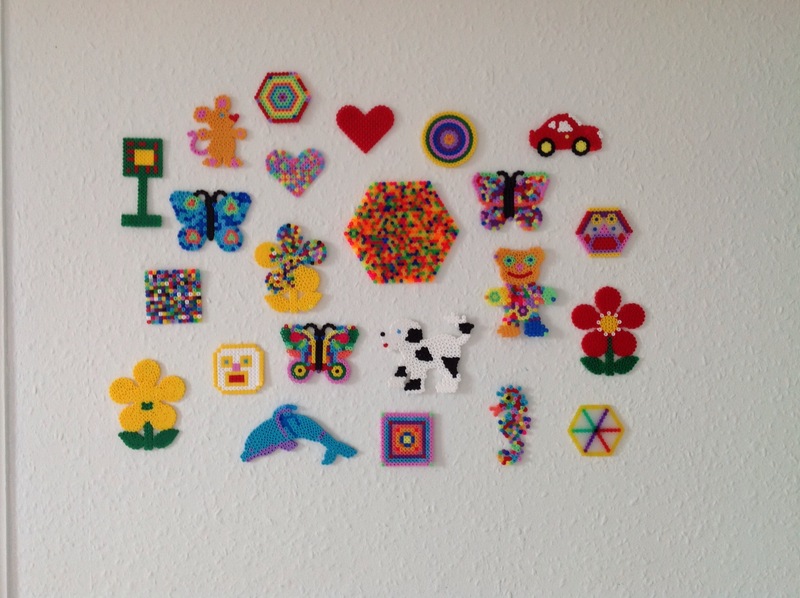 For those of you who don’t know, Hama Beads are tiny beads that you place on a frame to create a sort of mosaic. 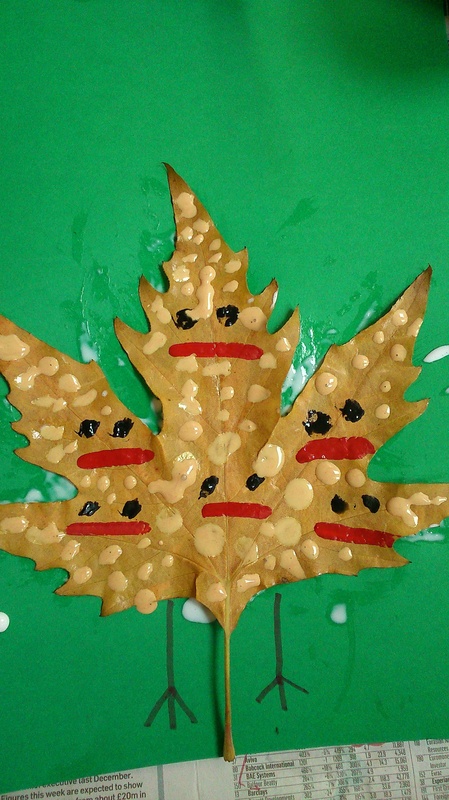 Once your child has made a mosaic they like, a grown up covers it with some special paper and irons over it so that the little plastic beads all stick together. I discovered them by accident a few weeks ago during a play date. The mummy host (Hi Kinnary!) wheeled out her Hama beads and all of the kids were instantly entranced. After that, I decided we needed them in our lives and went on the hunt to get some. We ended up getting the Hama Beads Group Suitcase from Argos which costs £39.99. It has loads of beads and plenty of templates to use, but prices do start from as little as £7.99 for the Little Princess set which also makes them brilliant stocking fillers or gifts for kids birthday parties. It looks like Argos have loads of deals on these at the moment but I’m not sure how long they’ll last for. 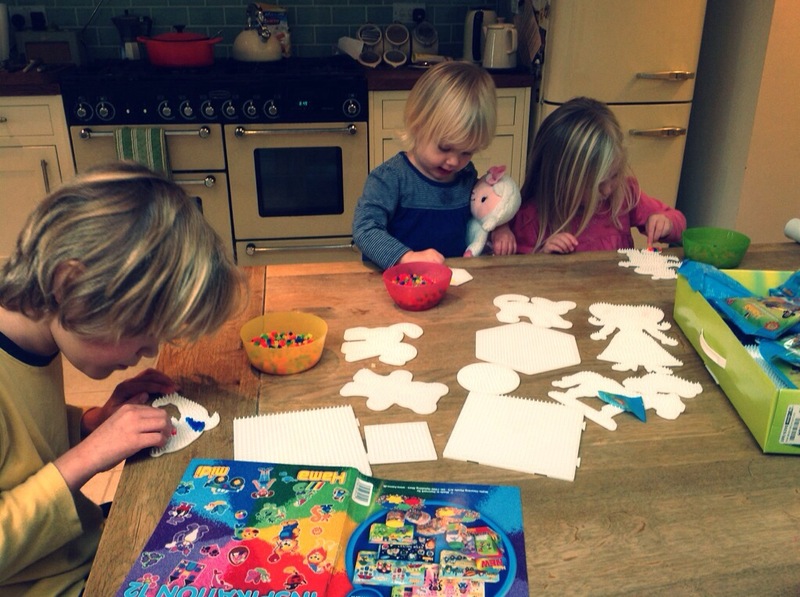 We recently had our cousins over and after the initial excitement of running about and giving Maisie and the baby an extraordinary makeover, they noticed the Hama beads and immediately wanted to play with them. What ensued was an hour of peace and companionable quiet. Hama Beads are a bit like Lego, kids are happy to play with them for hours without squabbling or more importantly parental guidance. If you’re after some inspiration for Christams gifts then do consider these as an alternative to all the robots and crazy electronics that are about this year. If however, you’re feeling the need for some electronic craziness then check out Argos’s Dream Toys 2013 list which has loads of inspiration. Autumn in Cambridge is gorgeous and this autumn is even better than normal because it’s so lovely and warm! 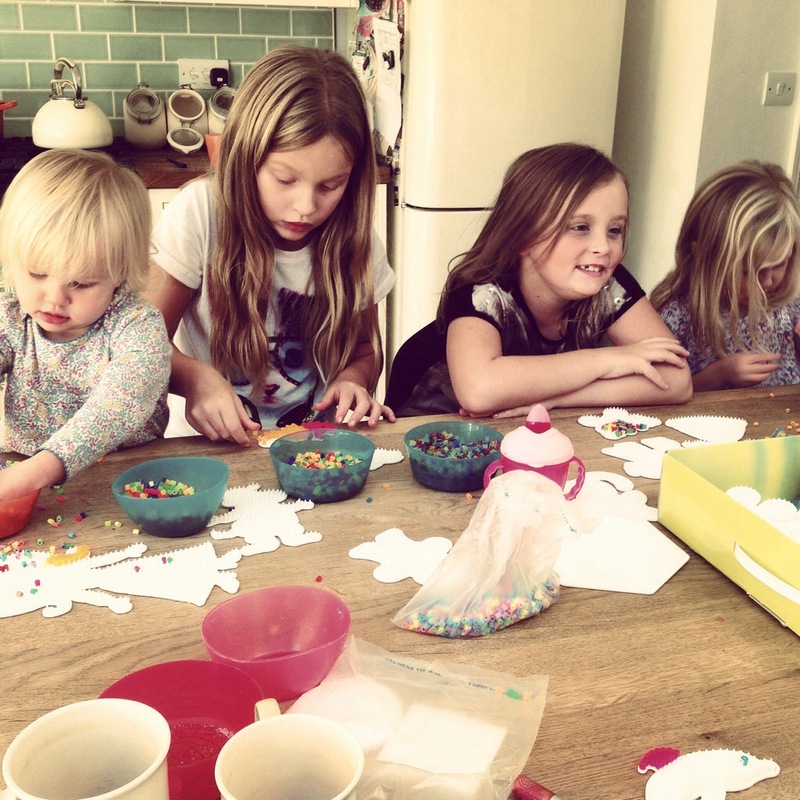 This past Tuesday we had a bit of a treat with the teachers strike which meant a random home day with all the kiddies. Now, before you start to think I’m one of those mothers who’s brilliant at being earthy and coming up with wonderful creative stuff, I need to tell you 2 important things. 1) This so called “treat” day started terribly. By 11am, everyone had been on the naughty step at least once and the dominant emotion in the house was rage. 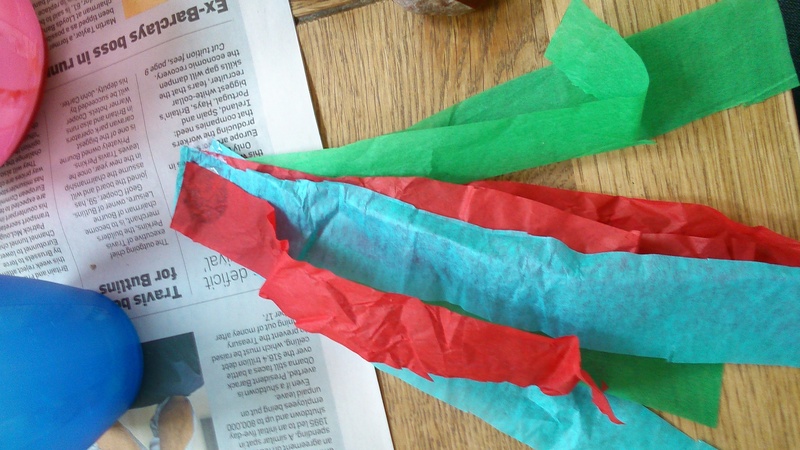 2) All of these crafts were thought of by other people. There is nothing original in what I’m about to share. Ok, so now that’s all out there, I can get on with sharing what we got up to. I have to say we had lots of fun and it’ll be a day I remember forever (in a good way!) 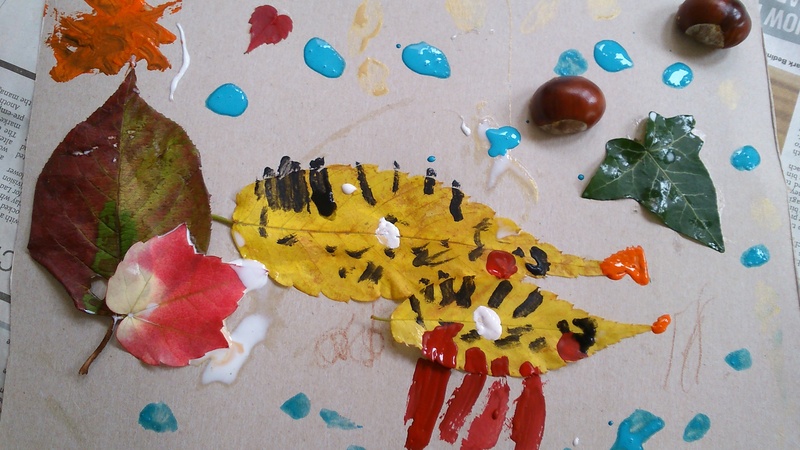 Before we left the house I had a look on Pinterest and found some cool crafts that we could get stuck into but to do them we needed supplies, conkers, acorn hats and lots of autumnal leaves. 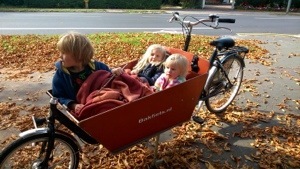 So, at 11am, when everyone was on the verge of total meltdown, I finally hauled us all into our big box-bike and headed off for the Botanical Gardens in Cambridge. As soon as they were outside in the fresh air and cruising around in the bike, they stopped fighting and started chatting and giggling and plotting our adventures. On arrival we decided to collect our supplies as secret agents which involved a lot of rather embarrassing (for me, the adult…) hiding behind bushes and whispering loudly, to be careful. We found lots of cool looking leaves, twigs, pine needles and acorn hats but no conkers, so we packed up our goodies, had some lunch and a play and set off on the hunt for conkers. 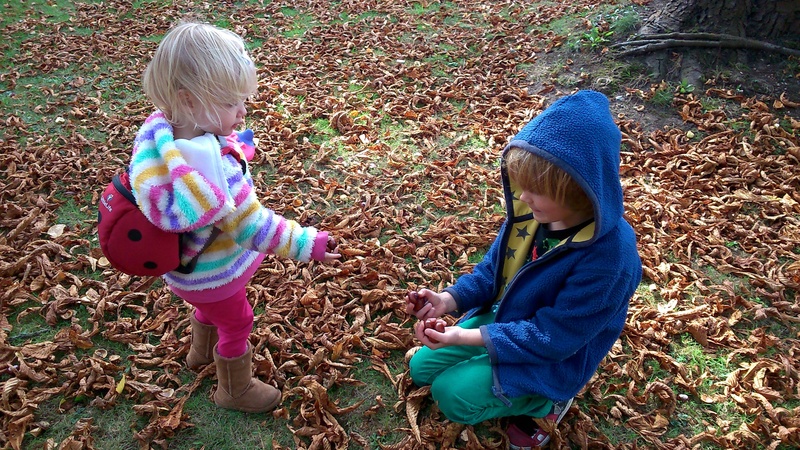 We eventually found an amazing hoard on a local road and filled up the bike with some beautiful conkers. 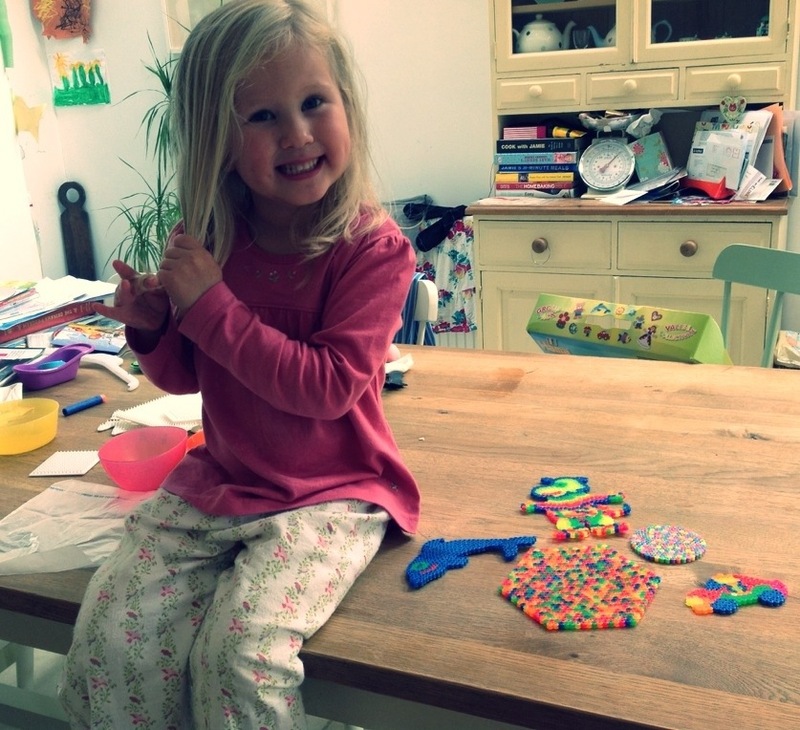 When we eventually got home and put Izzy down for a nap, the crafts finally began. 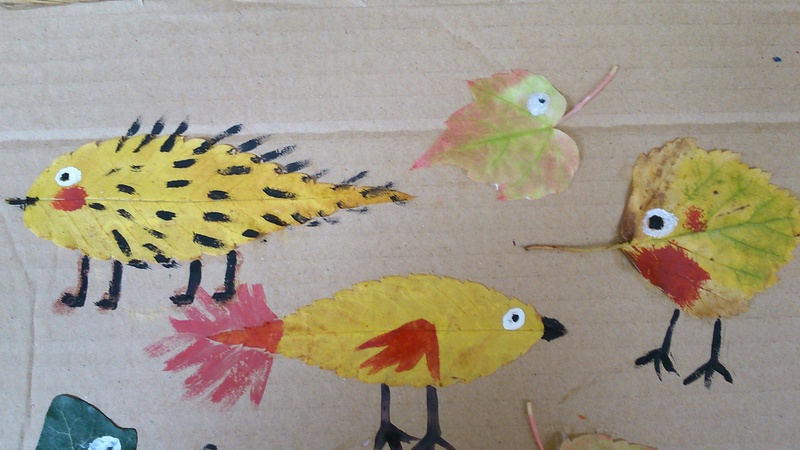 Sam made the leaf monster of many faces (left) and the leaf creatures on the right and Maisie made the top creative masterpiece! 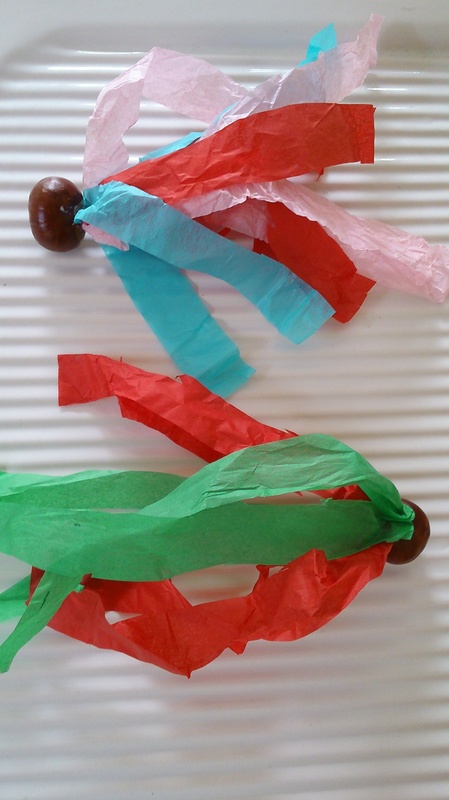 Then make a hole in a conker (I used a BBQ skewer) fill the hole with glue and poke the tissue paper into the holes. Wait about half an hour for them to dry and then you can have competitions to see who can throw them the furthest. They’re pretty satisfying to throw and go pretty far! These were the least successful of our efforts but still pretty fun. What you’re supposed to do is use a felt tip pen to colour the inside of the hat and then put a little bit of PVA glue in the hat and leave it to dry overnight. I did eventually read the instructions but think I used too much felt-tip colour in the hat. 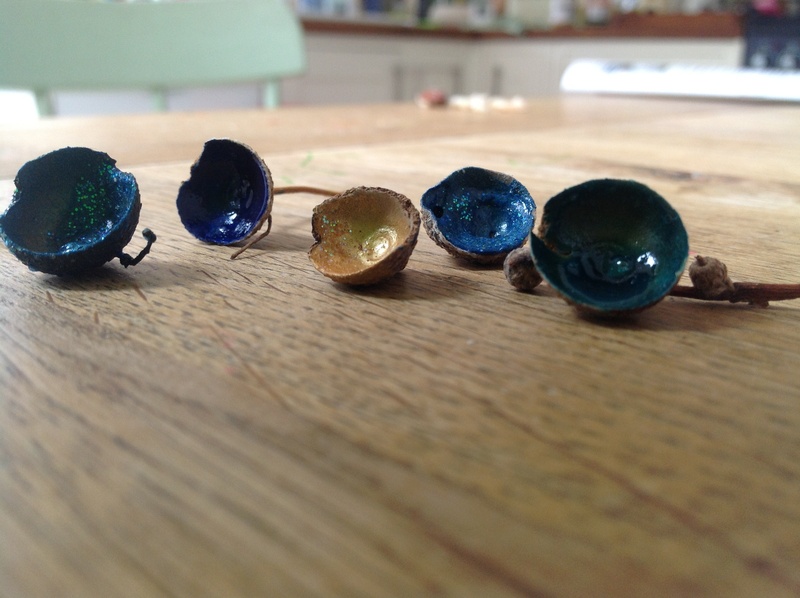 Just use a little colour and it will bleed prettily into the glue. What I did before reading the instructions was mix some poster paint with some glue and add glitter. Still looks quite pretty though. You can see all the original inspirations and get some more ideas by going to my Pinterest board. I’ve been meaning to write this up for ages. Maisie celebrated her 4th birthday at Cheeky Monkeys and we had such a fantastic time that I wanted to shout about it! We’ve been going to Cheeky Monkeys for nearly seven years now and one of the things I love is that at least 2 of the key staff have been there for at least as long as we’ve been going. The lady who looked after us during the party even knew my children’s names which was above and beyond in terms of good customer service. 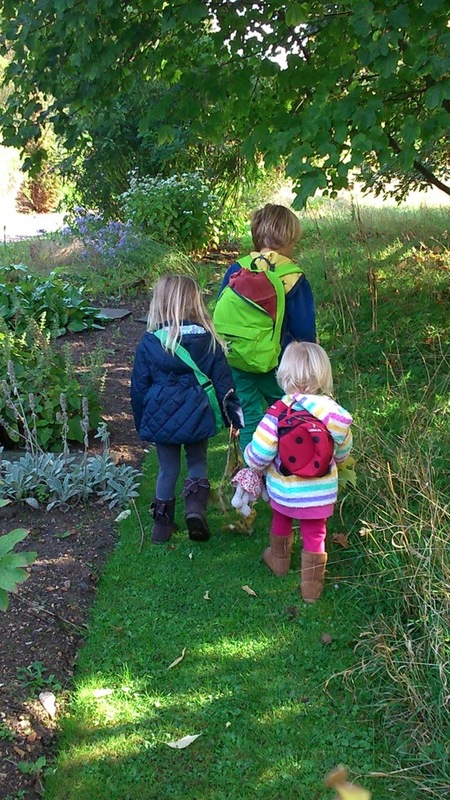 There are 2 offerings, exclusive use, which is £10 per child (Mondays only) and shared use where you share with the public. This costs £7.50 for weekday parties and £8.50 for weekend parties. 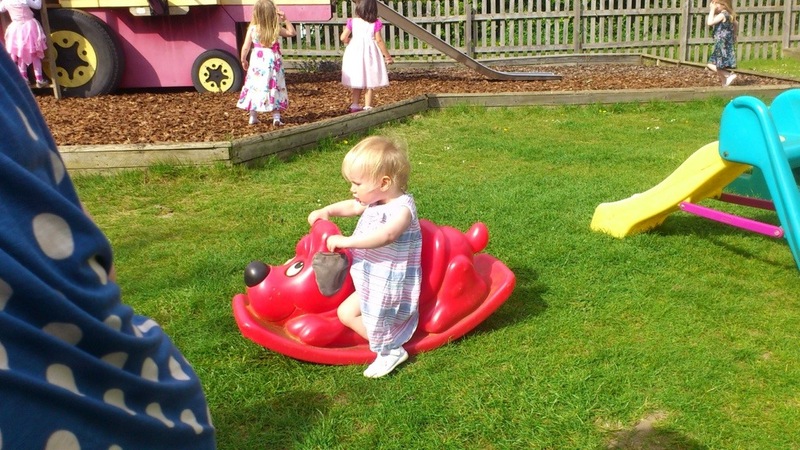 Included in the price is 90 minutes in the Playbarn or outside and 30 minutes for the party tea. 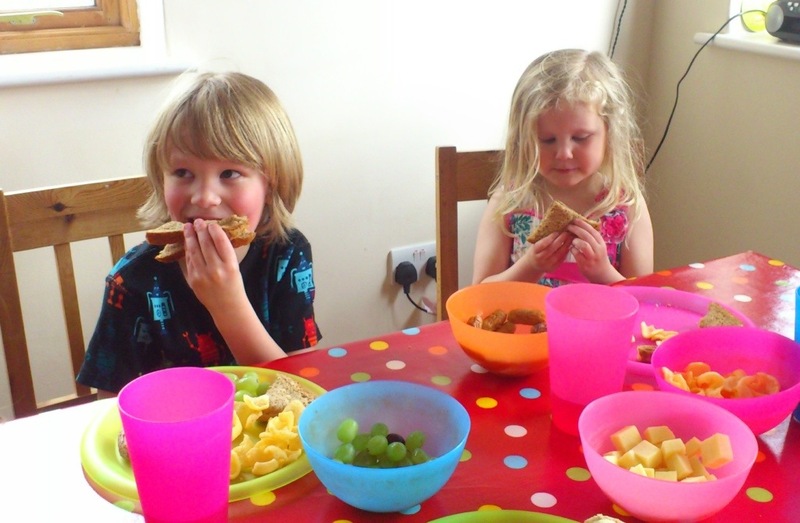 The party tea includes a selection of sandwiches, mini sausages, crisps, cheese cubes, grapes, cherry tomatoes, cakes, biscuits, raisins and unlimited jugs of squash. All parents have to do is to bring a cake and the party bags. There are 2 venues for the party tea, one is in a little barn just outside of the main Playbarn. This is decked out with twinkly lights and party decorations and is a lovely cosy room for a party. Ours was in the extension on the right hand side of the Playbarn and was perfect as it was large enough for our group and nice and bright so we could enjoy the sunshine and the view of the fields. The day of Maisie’s party was beautifully sunny so we were all able to make use of the fabulous outside space. There are climbing frames galore, tractors, roundabouts and slides so the kids certainly didn’t struggle for entertainment. 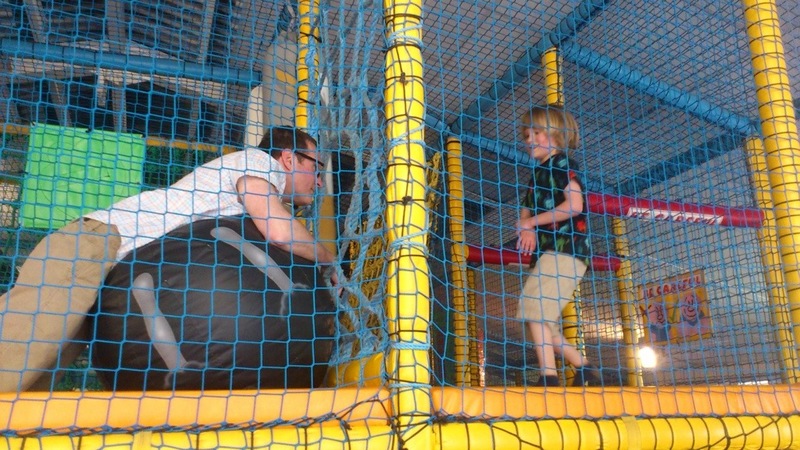 Inside is ideal for smaller kids as it’s not huge like some of the other local play barns. This means you can easily find and/or control the children and they don’t tend to get overwhelmed. The party tea was stress free, I just sat back nattering to other mums while the team served food and drink to the children. 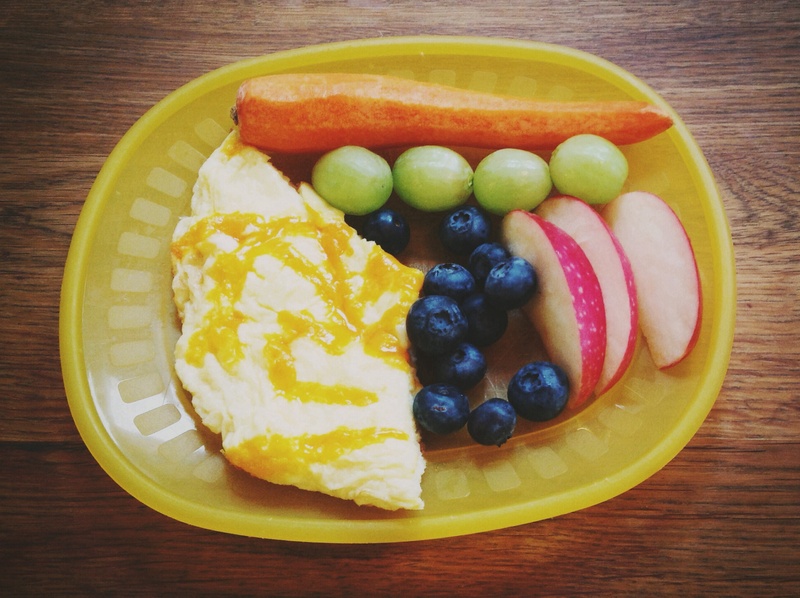 The food itself was fine, just what you would expect for a party and with enough fruit and veg to help you feel you’re at least tipping your cap to healthy eating. They’ve got the whole party thing down to a fine art. There’s a box for presents when you arrive and all the staff are keen to help and make the party run as smoothly as possible. I would definitely recommend Cheeky Monkeys as a party venue and it’s not just ideal for the tiny ones. In fact Sam’s going to a friends 7th birthday party there next week and I’m sure they’ll have a blast. One of the best things about it is that I trust the staff. I know that if I leave one of my children there for a party they’ll be absolutely fine, because the ladies who run it are quietly authoritative and don’t put up with any dangerous play or nonsense. 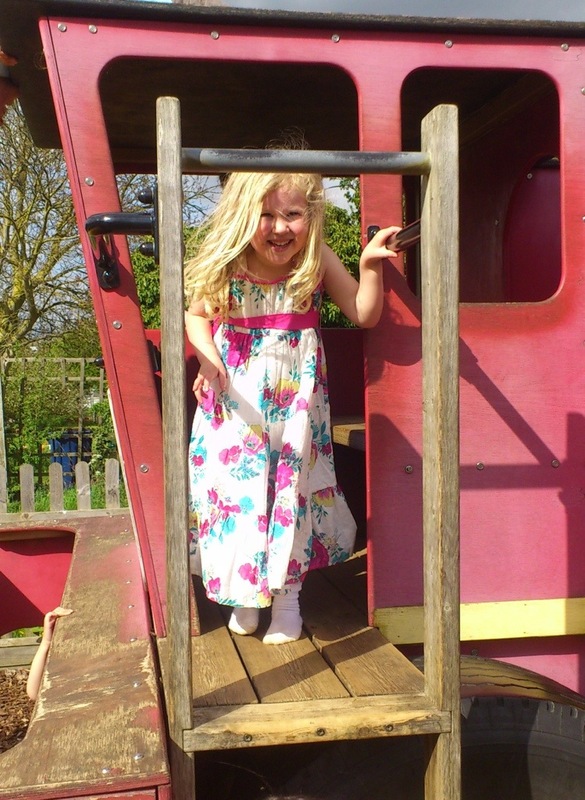 Thanks Cheeky Monkeys, Maisie had a fantastic time and so did we! 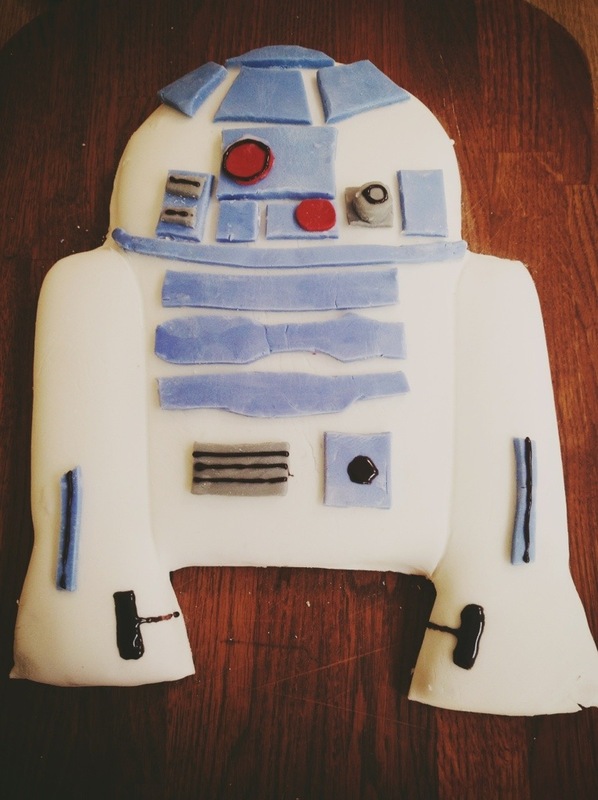 How to make an easy R2D2 Cake. I want to start off by saying that I am NOT a baking queen. 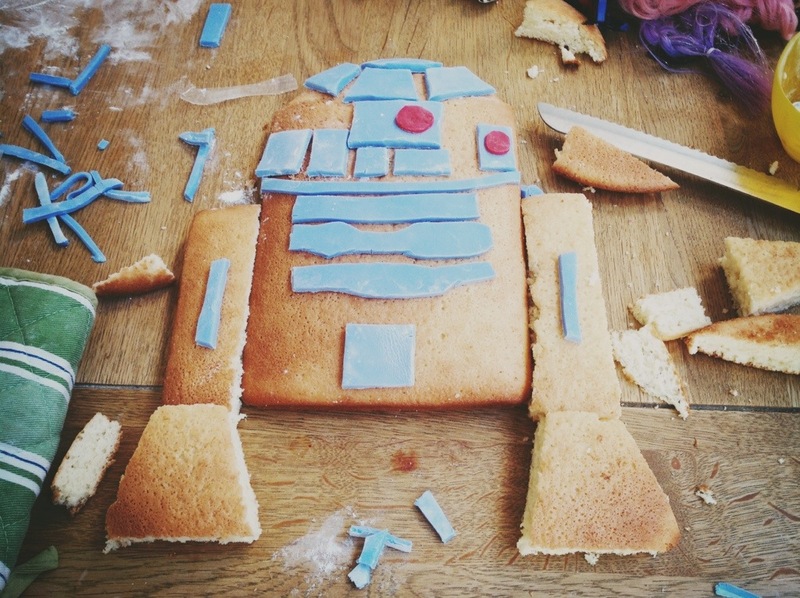 Cooking generally horrifies me, but now and again I fancy a challenge and when Sam mentioned he wanted a Star Wars themed birthday cake, I decided to trawl Pinterest to get some ideas. 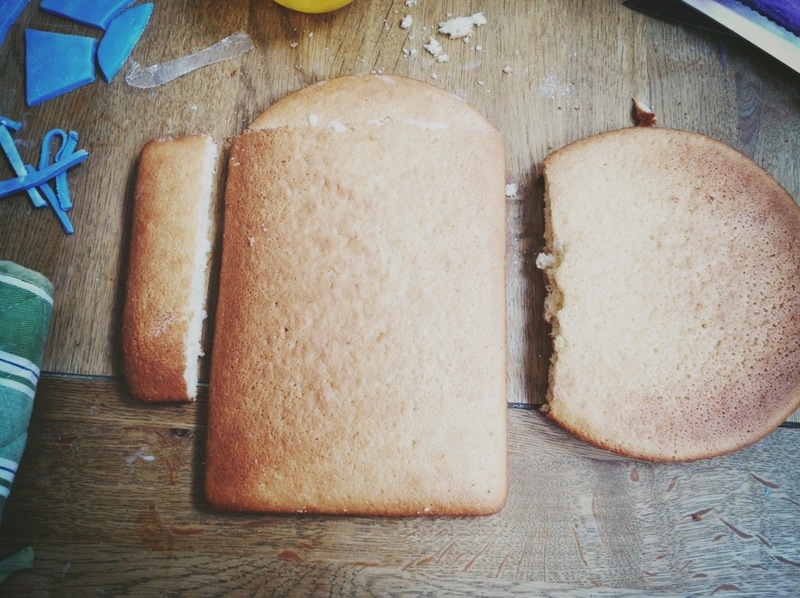 Initially I was horrified, most of the cakes on Pinterest aren’t even flat! They’re properly 3D, standing up replicas of the little chap – I kid you not. Thankfully though there were some flat ones that looked pretty good, so I looked up some actual images of R2D2 and came up with my own version. To make the body of the cake, I used a round tin and a rectangular tin, one pack of mix in each. When they had cooked and cooled, I cut the top of the rectangle off (the cut off bit will become an arm) and cut the top off the circle. 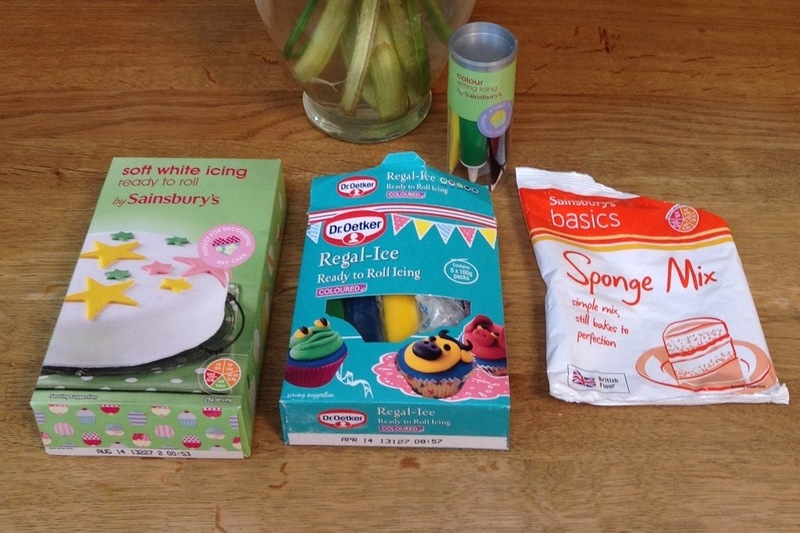 I then stuck the top of the circle onto the top of the cake with some icing sugar mixed with water. 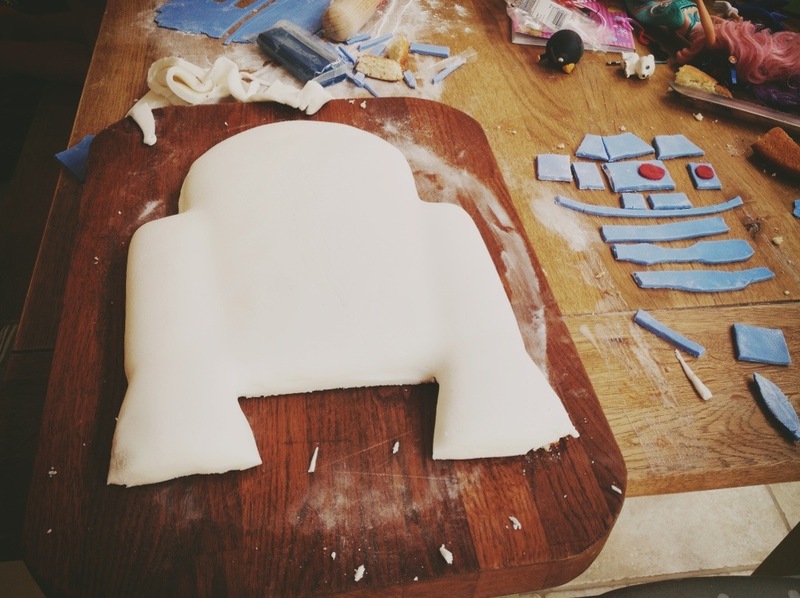 I then used the cut-off piece of cake as a template for R2D2’s other arm and stuck both the arms to the main body of cake with icing sugar. Once the arms were stuck on I just cut out the feet from the remainder of the circle cake. At this point when you have the true shape of the cake you can roll out the blue and white icing and cut out the blue shapes (I just did it freestyle with a sharpe knife) It’s important to sprinkle some icing sugar on the table so that the rolled icing doesn’t stick. I also used a long flat metal thing (what’s it called?!) to help unstick it from the table. After that it was time to lift the rolled white icing off the table, onto the cake and gently press down all around, cutting off the excess icing. Once I was satisfied that it looked alright I just stuck on all my cut out bits with some icing and added a few details with the icing pen. 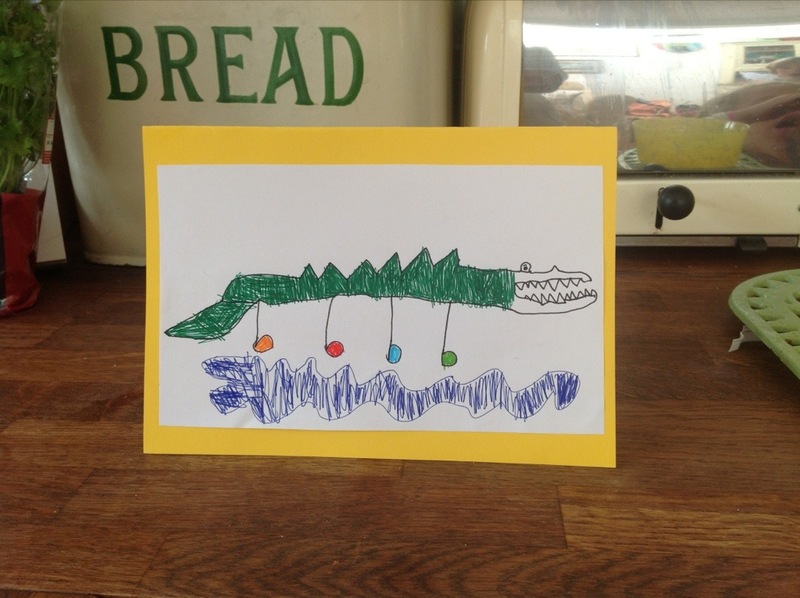 Sam Draws… A Crocodile wearing his dancing shoes. 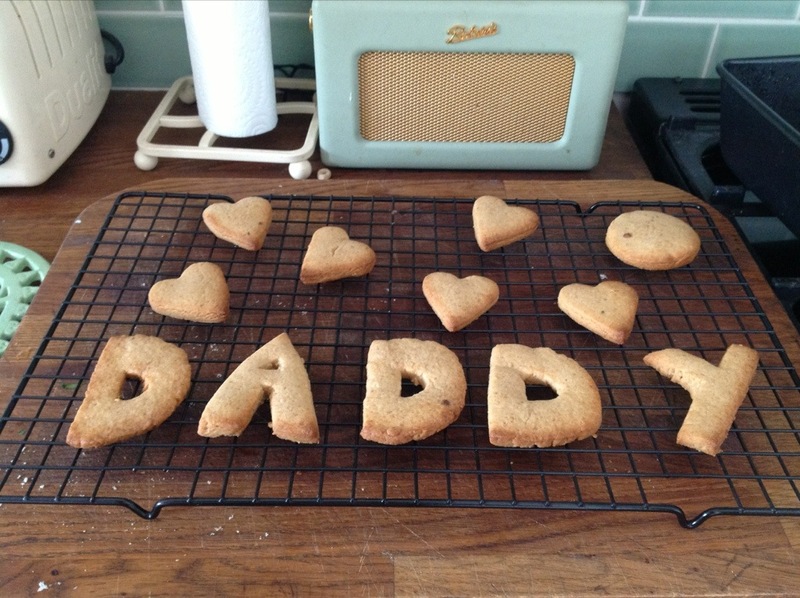 I got the idea for this from this from Pintrest, which had, DAD, made from biscuits. The pin was from Martha Stuart’s website but I decided to adapt my own biscuit recipe to make our own version. 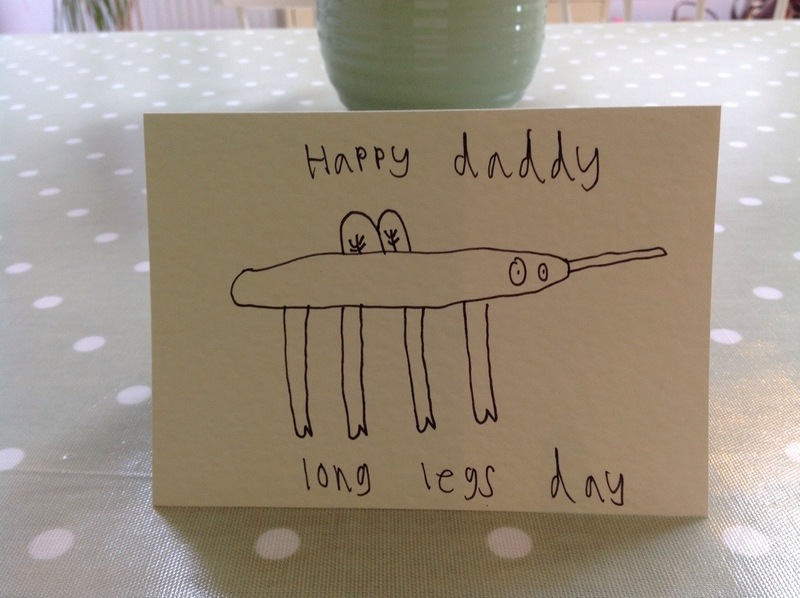 This is a lovely gift for dad and the best bit is you’ll probably have all the ingredients! 2oz (50g) Brown Demerara sugar or normal sugar will work too. Add water if needed but only a few drops at a time! 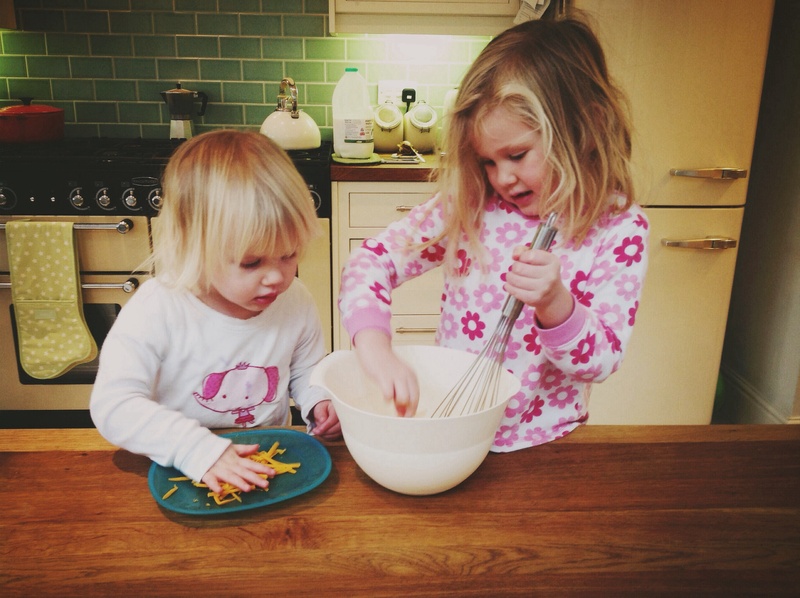 Mix the plain flour with the Demerara sugar in a large mixing bowl. 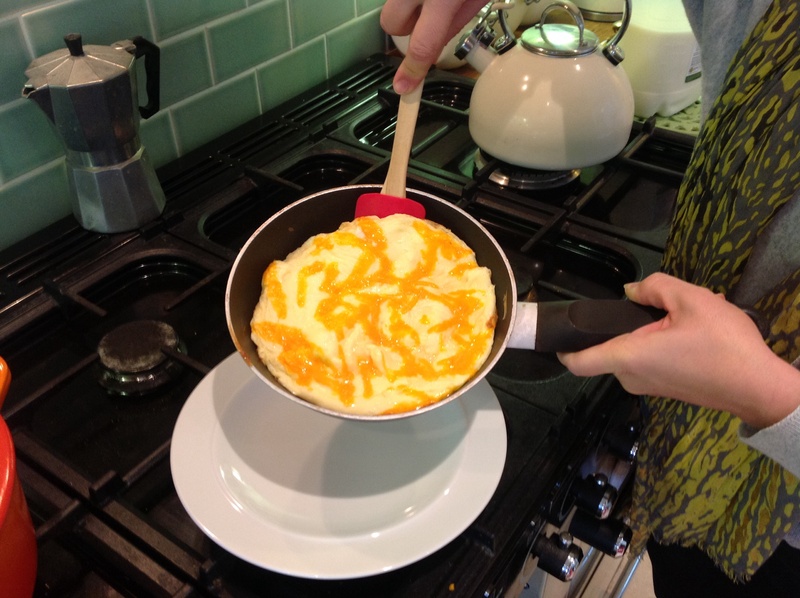 Roll out to 1/4″ (6mm) thickness on some grease proof paper (This means your biscuits are less likely to break when they’re moved onto a baking tray. 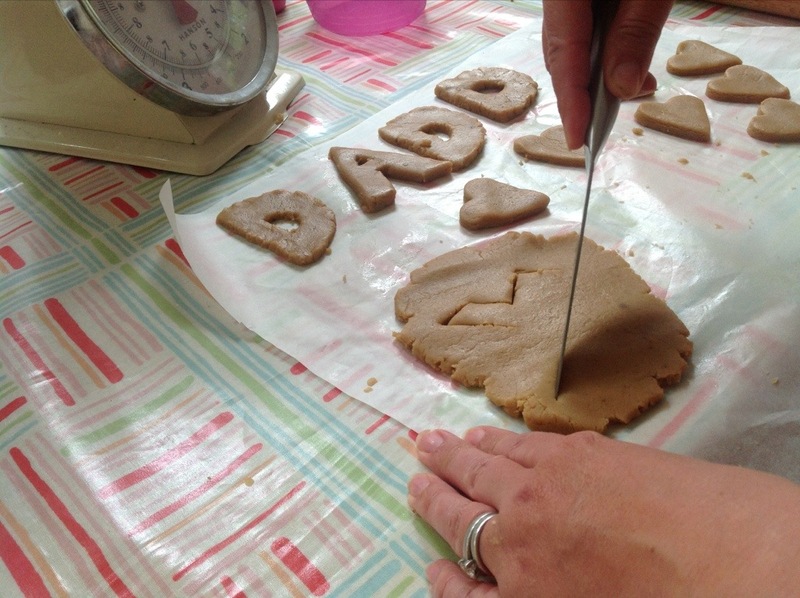 Cut hearts using a biscuit cutter, freestyle cutting the letters with a sharp knife. Transfer biscuits on the grease proof paper and lay on a baking tray. 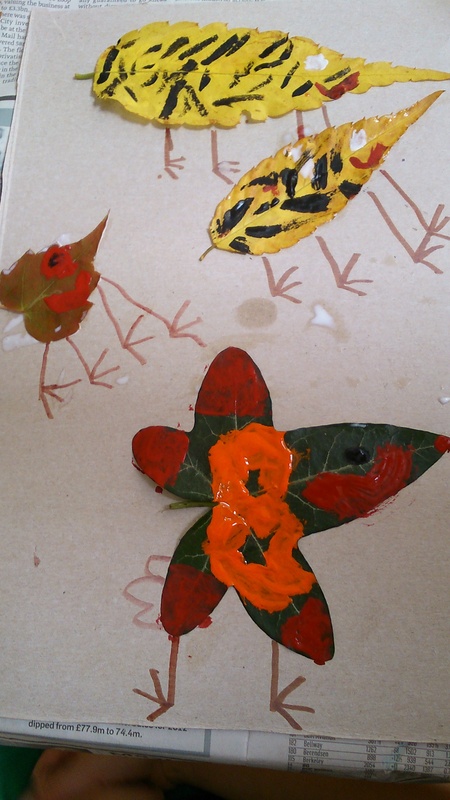 Once they’ve cooled down you can decorate, we used bright icing but to be honest they looked much better pre-icing! 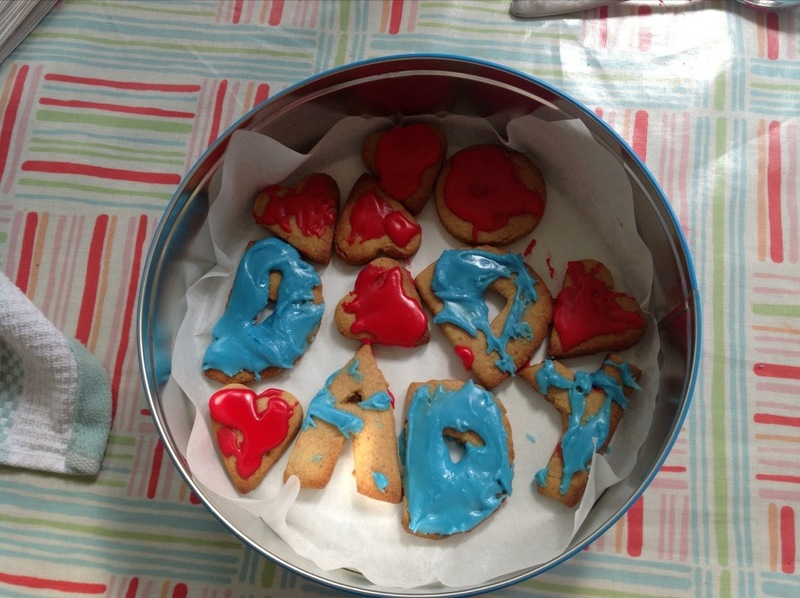 Another nice way to decorate, is to sprinkle a little icing sugar onto the biscuits but as you can see that was not the option my kids went for. 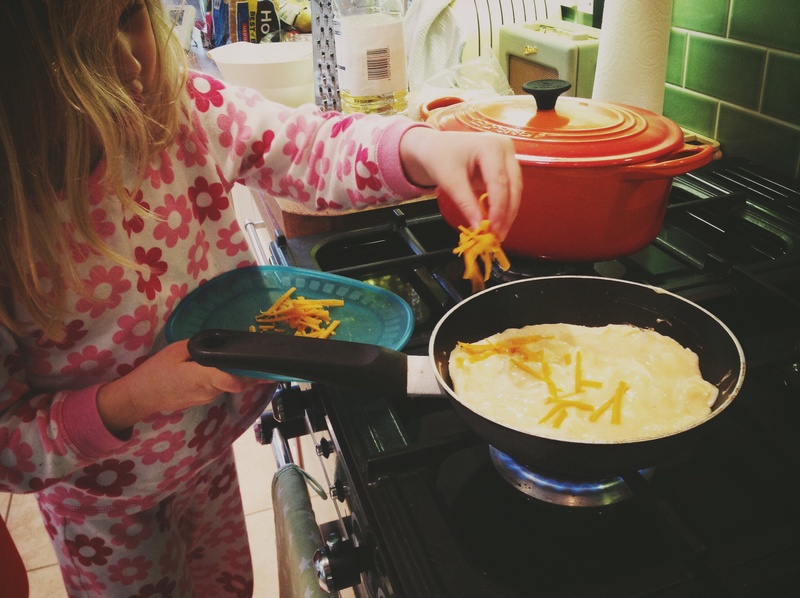 They decided “Biscuit Massacre” was more their style… Well, at least they enjoyed it!